Girl Charlee Fabrics: [CLOSED] Girl Charlee 5K Fan Giveaway!! 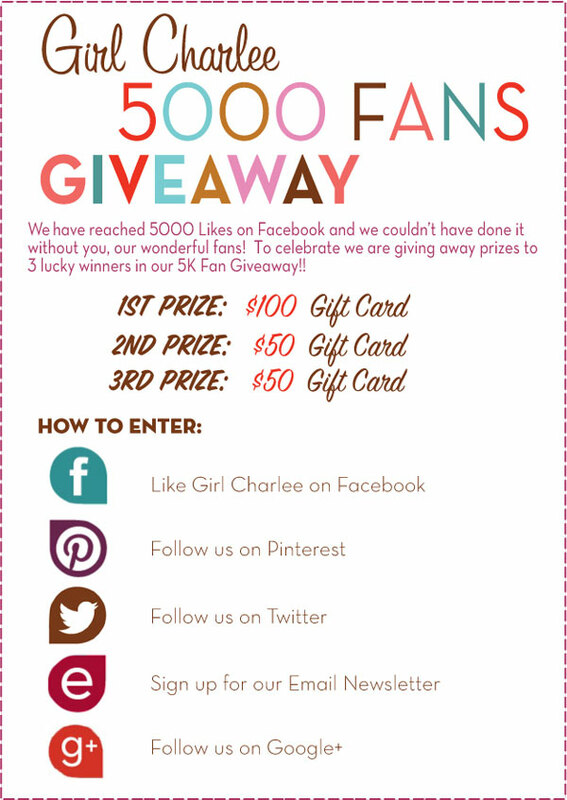 [CLOSED] Girl Charlee 5K Fan Giveaway!! We are so excited to reach 5,000 'Likes' on Facebook! To thank our wonderful fans we are giving away three prizes to three lucky winners. It is super easy to enter -- just click on the Punch Tab app below and follow the simple steps. You can also earn extra entries by Following us on Pinterest, Google+, Twitter, and signing up for our newsletter! Enter by 11:59pm PST, March 28, 2013. Winners will be announced on Friday, March 29. One (1) lucky winner will receive a $100 Girl Charlee Fabrics gift card, and two (2) lucky winners will each receive a $50 Girl Charlee Fabrics gift card. Girl Charlee gift cards are good to use on anything in the store and do not expire. Winners will be contacted through email and also announced on our Facebook page. Share with your friends and we wish each of you the best of luck! I followed you everywhere! Love your fabric. But I can't click on the app in the post.. Do I need to? Awesome, so so awesome! Thanks for the shot at delicious fabric! I love all of the fabric I've ever ordered from you! Thanks for the giveaway!! Oooh I was so excited to see you had an email option since I don't have facebook but when I click enter it doesn't work. Love your fabric, I'm actually wearing a top from it today. Hope I get something figured out so I can enter this great giveaway. When all else fails keep refreshing the page! I finally got it to work and was able to enter!! I pinned on PInterest too! So excited for this!! thanks so much for the giveaway - new fan and customer and love every order so far! congrats! Hi Emily. Try refreshing the page and see if it works now. Let me know if you're still having trouble! The Google+ entry won't work for me. I've followed and +1 and nothing happens. I am trying to enter, but it says the giveaway has ended...Is it still going until tonight?? Hi Jessica! No, it ends till midnight, and seems to work fine on my end. What browser are you using? According to PunchTab support, Firefox sometimes has issues with the widget, but it should work if you refresh. Let me know if you are still having trouble and I will figure out what is going on. Thanks!